I shall be contacting you shortly about your Custom-covered Kindle Paperwhite! But if you didn’t win… never fear! I already have another contest locked and loaded. Remember when I glued some gears on a YouTube video and made a trailer? 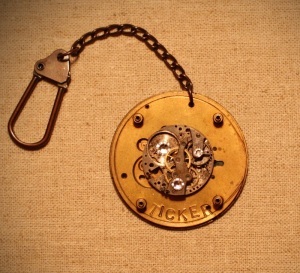 the first One-Of-A-Kind TICKER Dingle-dangle! 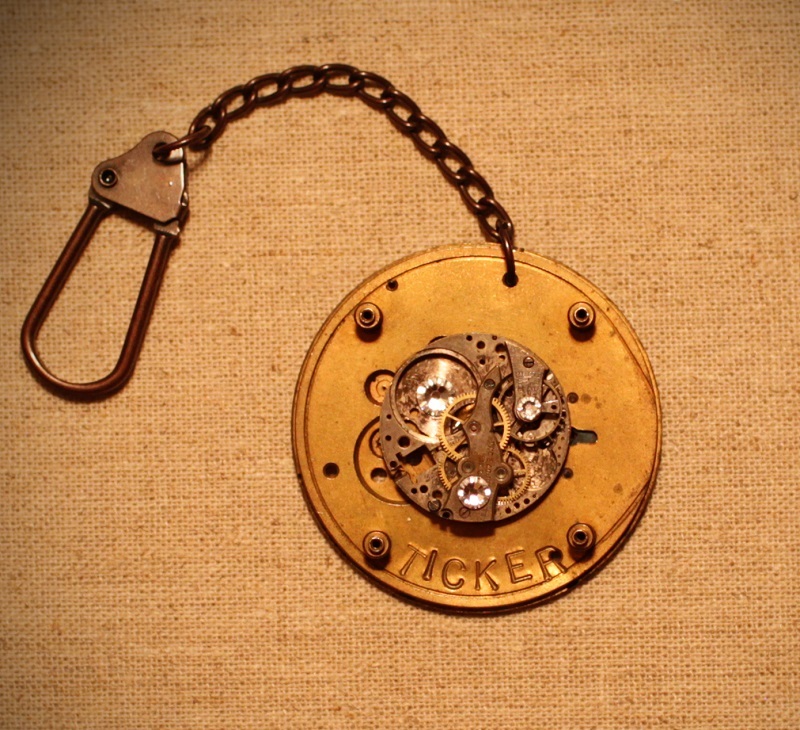 Made by my skilled (and long-suffering husband) with the aid of yours truly, no two of these letter-stamped pocket watch bits art pieces will be alike. Some parts are are vintage while others are not, but all the repurposed metal pieces have been run through an autoclave for cleanliness. Disclaimer: because of the nature of the item, I recommend this be a display piece rather than worn as jewelry. I don’t have the means to check for Ray Ban Baratas radioactivity, lead paint, or anything that might lead to future X-Men mutant superpowers, so by entering to win the piece, you agree you’re good with all the above. Contest runs like Penny’s Vitesse until 12 AM November 24th, Pacific Standard Time. Must be 18 or have a parent’s permission to enter. There are multiple ways (and multiple DAYS) you can enter to win. You start by watching the trailer. You can then share the trailer (or the link to the trailer) on 2 kinds of social media, such as your blog, Pinterest, Tumblr, or G+. Facebook cannot be counted for points, because of their contest policy, but you can still post it there for karma points! You can Tweet about the contest every day for more points. Bazalgate Shopkeeps – Launch Week Giveaway!